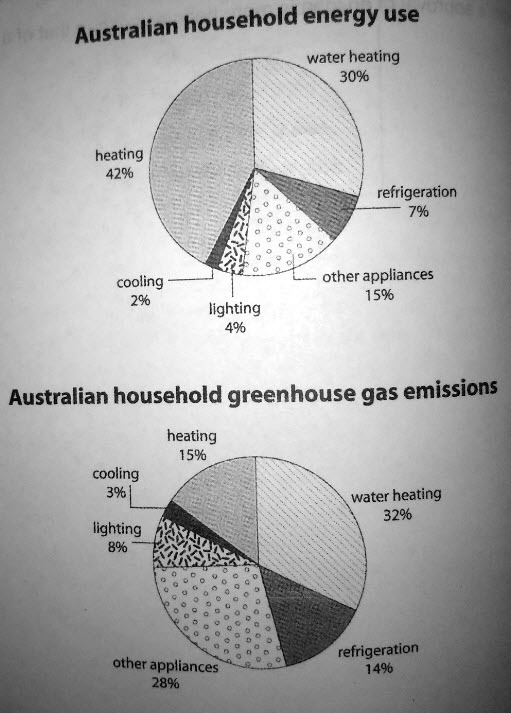 The first pie chart illustrates the percentages of energy usages in a typical Austrailian family while the second chart indicates how greenhouse gas emitted from this energy consumption. Overall, even though the more energy is consumed, the more greenhouse gas is not emitted. As can be seen, Australian houses consumed most of energy on water heating and heating at 30% and 42% respectively. However, the proportion of heating in greenhouse stood at only just over a fifth while that of water heating accounted for just under a third. Furthermore, it was noticeable that although the proportion of other appliance usage was 15% that of the greenhouse emission almost doubled at approximately a quarter. When it comes to consumption of refrigeration, cooling and lighting, those took minor proportions at 7%, 2% and 4% respectively. Moreoever, the percentages of greenhouse gas emissions followed by them were also small at 14%, 3% and 8% respectively. Where is the pie chart? Is There His Height Or Is His Height?